FILE - A makeshift camp of shipping containers and tents houses migrants in the 'jungle,' a sprawling camp at the French port of Calais. Two camps planned in Paris could lead to its dismantling. Paris will house close to 1,000 migrants in two camps to tackle the growing number of men, women and children fleeing war and poverty who are sleeping rough on the French capital's streets, the city's mayor said on Tuesday. The building of the two camps in the capital comes as the government faces pressure to dismantle a swollen shantytown dubbed the "jungle" near the port of Calais, whose inhabitants are blamed by residents for an increase in crime and the ailing local economy. "We have to come up with new ways of overcoming the situation. Things are saturated," Hidalgo said at a news conference. "These migrant camps reflect our values." Hidalgo said the camps would be temporary and would cost 6.5 million euros, or $7.25 million, to set up. Paris municipal authorities would cover 80 percent. 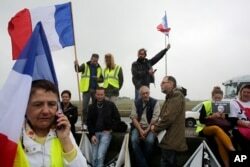 Truck drivers, farmers and Calais business owners on Monday blocked traffic on the motorway approach to Calais, demanding a deadline for dismantling of the "jungle." Demonstrators hold French flags as truckers block the highway near Calais, northern France, Sept. 5, 2016.